Kim Kardashian truly is a huge fan of Nicole Richie's House of Harlow 1960 jewellery collection. Here is Kim Kardashian leaving a restaurant yesterday afternoon wearing a stunning gold diamond shaped House of Harlow 1960 headpiece. 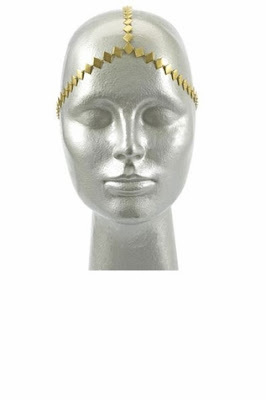 You can purchase this stunning House of Harlow 1960 gold Diamond shaped Three-Strand Head Piece from shopthetrendboutique.com for $195. If this House of Harlow headpiece is a little out of your price range, then check out the amazing head pieces at UK based store ClaudiaPink.com. Their headpieces are all handmade and start at just £35. I have one and it is truly stunning. On another note I am loving Kim Kardashian's Balmain Jeans.